Gearbox Software CEO Randy Pitchford has confirmed Ashly Burch will be back to voice Tiny Tina in Borderlands 3. Pitchford replied to a fan on Twitter who asked if Burch would be returning to voice the much loved explosive expert in the upcoming game, to which Pitchford confirmed “Yes she has returned”. Tiny Tina has always been a fan favourite for her explosive personality. Burch really brought Tina to life and made her one of the most memorable characters in the series. The bunny-loving little teapot was first introduced in Borderlands 2 and was the star of the hilariously fun DLC, Tiny Tina’s Assault on Dragon Keep. The confirmation will no doubt put fans of the character at ease after the recent drama surrounding the news that Troy Baker, who voiced Rhys from Telltale's Tales from the Borderlands, won’t be reprising the role. As we’ve seen in the recent Borderlands 3 trailer - and as confirmed by Pitchford in the recent reveal event - Tiny Tina won’t be so tiny when we next meet her. 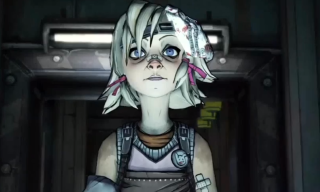 Tina was just thirteen in Borderlands 2, but she’ll be several years older in the upcoming game, so it’ll be interesting to hear if her voice has matured along with her. Still, she’s sure to still be the crumpet-loving tea party host we all know and love. Want to know more? Here are 14 details you might have missed in the new Borderlands 3 trailer.